From songbird-eating snakes in Guam to cheatgrass in the Great Plains, "invasives" are wreaking havoc around the world. 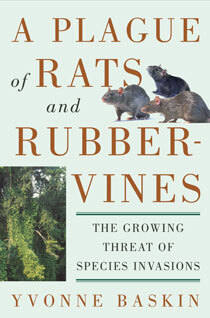 In A Plague of Rats and Rubbervines, widely published science writer Yvonne Baskin draws on extensive research to provide an engaging and authoritative overview of the problem of harmful invasive alien species. She takes the reader on a worldwide tour of grasslands, gardens, waterways, and forests, describing the troubles caused by exotic organisms that run amok in new settings and examining how commerce and travel on an increasingly connected planet are exacerbating this oldest of human-created problems. She offers examples of potential solutions and profiles dedicated individuals worldwide who are working tirelessly to protect the places and creatures they love. "A must read for any concerned citizen—you will not be able to put this book down!" Chapter 12. Can We Preserve Integrity of Place?